The 40 lb. 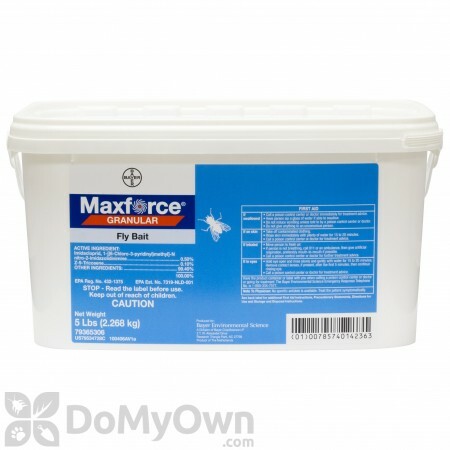 container of Maxforce Granular Fly Bait has been discontinued by the manufacturer. Maxforce Fly Spot Bait 16 oz. New Maxforce Granular Fly Bait contains two powerful attractants combined with imidacloprid, a new active ingredient for the control of flies that is non-repellent and works quickly — even against flies resistant to OP and carbamate insecticides. Applied as a broadcast application, placed in bait stations, or dissolved in water and paint on surfaces, Maxforce Granular Fly Bait controls flies for up to 30 days. And with just 0.5% active and low toxicity to non-target animals, Maxforce Granular Fly Bait also contains Bitrex bittering agent to help prevent accidental ingestion by children and pets. Time your applications to begin at the start of season, before fly populations reach their peak. Avoid cool or windy locations because flies prefer warm sites for resting. Scatter application: Scatter the bait directly form the container onto dry level surfaces so that the individual granules lie near each other without forming small piles. Paint-on application: Mix 1.5 ounces of bait with 1 fl oz. warm water (3 lbs. bait in 1 quart of water) and stir thoroughly. Let stand for about 15 minutes until a paste consistency suitable for painting has formed. Apply paste with a brush to surfaces where flies rest, avoiding surfaces that are dusty. LOVE this stuff!! We were taken over by flies in the barn and I can't say enough about this product. I can say IT WORKS! We have tried everything and nothing compares. Will never be without it in our barn! Haven't been using the fly bait very long, but it seems to be doing the job well. Also works as ant control. The transaction with Domyownpestcontrol was great. Fast shipping and a fair price. I have a restaurant and had tried EVERYTHING to deal with the flies. I put this stuff out as a scatter bait and in one bait station by the dumpsters. Amazing! We went from overwhelmed with flies to hardly any from one day to the next. The ground around my dumpsters was covered in dead flys the day after I put this out! I wish I'd found it sooner. We live in a residential area and have three dogs. We love to bbq during the summer, but the flys got to be unbearable by mid to late summer. No matter how clean we kept the yard the problem never went away. We purchased a few of the bag type fly traps, which worked but then our yard smelled like dead animals. After receiving our maxforce I made up several bait stations and placed them around the yard. It has greatly reduced the number of fly's, and does kill them within a matter of seconds after they land on it. Years ago I used a product called golden malrin, back then this was the best fly bait around. It would draw the flys in and kill very fast. Before buying the maxforce I purchased a can of the golden malrin, which used to be tan in color but now if blue. The manufacturer said they didn't change the formula, but it is no longer affective, and I consider it to be a waste of money. I have not found anything as affective as Maxforce. Own a restaurant and flies are a big no-no! Best product I have found to take care of flies in and around my dumpster. Highly recommend it. Can Maxforce Granular Fly Bait kill my dog if he eats it?? Will my dog eat it if left out?? 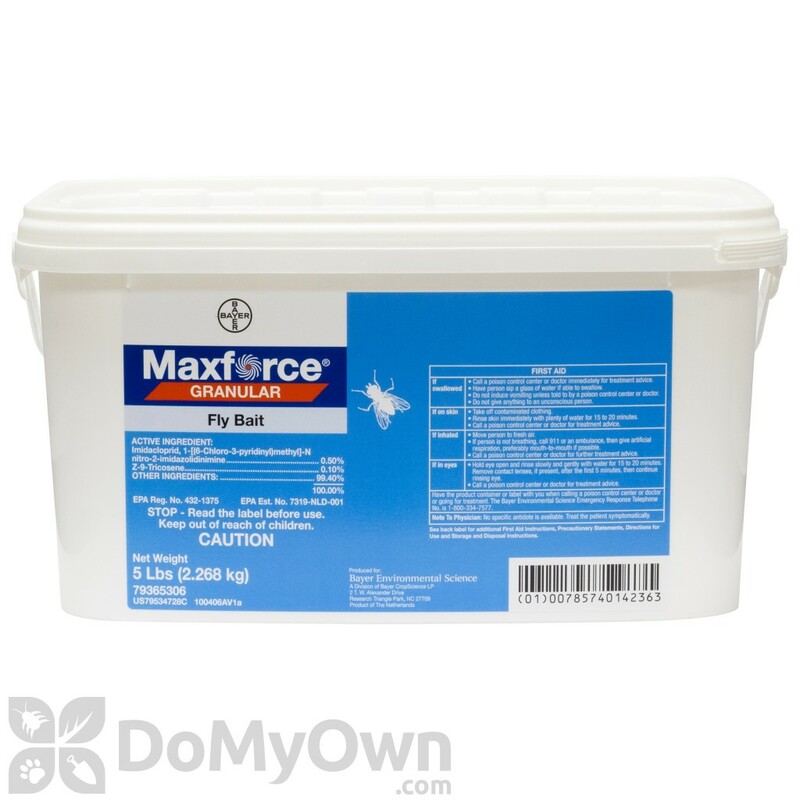 Maxforce Fly product can be dangerous for any animal if they eat enough of it. You can use the bait in a tamper resistant station to avoid having non-target animals consume the bait. 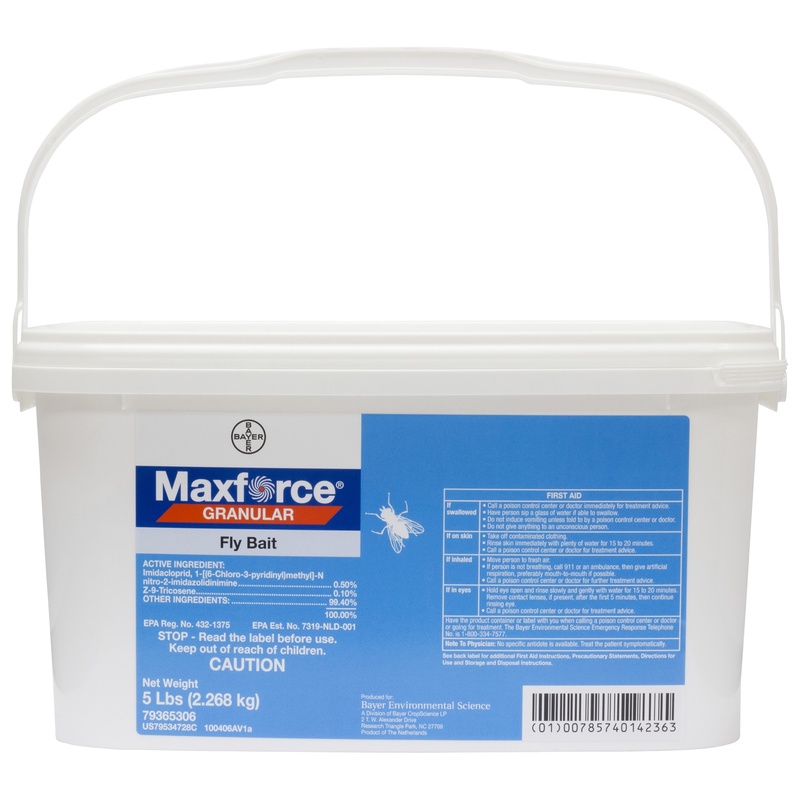 What is the shelf life of Maxforce Granular Fly Bait? I only have a fly problem during summer. Will it last a year or more in the bucket? The Maxforce Granular Fly Bait has a shelf life of 2 years unopened. Once it is opened, it will last about a year as long as you keep the lid on securely when not in use. You could expect to get two summers of treatment out of one bucket. 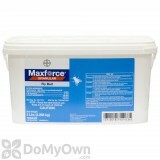 Can you tell me how long a 5 lb pail of Maxforce Granular Fly Bait will last using 6 stations? How long the product will last is completely dependent on the number of flies visiting the stations. The more flies you have the faster the bait will be consumed. how and where do the flies die? using a bait station, do the flies die "inside" the station, or do they fly out of the station and die elsewhere? If they die elsewhere, would it be dangerous for my chickens to consume the dead fly? There is not a set place that the flies will die. Some may die inside the station, some may not. It will depend on how much the fly eats and how far it makes it before the poison takes effect. The chance of any secondary poisoning to your chickens is extremely unlikely as the poison once ingested by the fly is only going to be a toxicity level to something the size of a fly. The only problem you would have is if the chickens were to consume the bait directly. If you have any further concerns you can contact the manufacturer Bayer 1-800-331-2867. Depending on where you are needing treat, you could use Maxforce Granular Fly Bait. 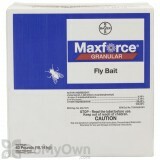 Maxforce granular fly bait kills flies in about 60 seconds, and keeps controlling them for up to 30 days. This extremely effective bait has an irresistible aroma and seductive pheromone that lures unsuspecting flies to their death. Please contact us at 866-581-7378 if you have any other questions.